Funny and lighthearted, this a delightful way for kids to learn about how to deal with minor irritations and make new friends. 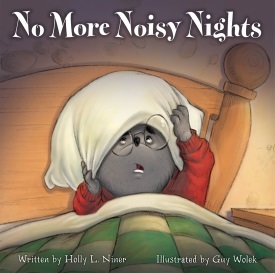 Jackson Mole moves into a new home only to be confronted by noisy neighbors. After an exhausting day of unpacking, he is unable to sleep due to the ghost in the attic “OOOEEEeee OOOEEEeee OOOing” all night. Rather than getting all upset and yelling at the ghost, he politely asks him to be quiet. The ghost is at a loss as to what else he can do. So, the next night, Jackson leaves the ghost a puzzle he can work on. Then the boogey monster in the basement goes “BOOGETY WOOGETY WHOOPS” all night, which calls for a train set to be provided. The pixie in the piano insists on “Plink! Plunk!” and Jackson gives her sheet music for a lullaby. All three become great friends of Jackson, who now gets a great night’s sleep. The author adds humor with Jackson’s sleepy antics, like pouring orange juice on his cereal and washing his face with toothpaste. Enchanting and detailed illustrations help to complete the feel of Jackson’s world, right down to the sorts of things a gentleman mole might have around his home. This is best as a read aloud, but kids will enjoy it as independent reading too.